What if San Francisco and Los Angeles faced each other in a civil war? 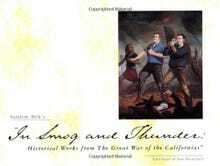 San Francisco and Los Angeles' rivalry turns into an all-out war in Sandow Birk's satirical art series In Smog and Thunder: The Great War of the Californias. 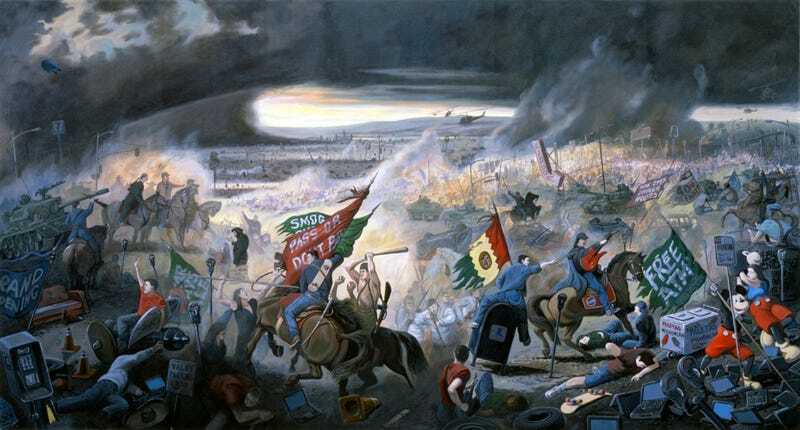 Birk created grand paintings and wry propaganda posters imagining the bloody battles between Northern California and South. The entire series consists of 120 works of art, including paintings, drawings, prints, faux war posters, maps, diagrams, and models. You can see more works from the series on Birk's website, but many of the works are also collected in a print volume. Birk draws on European and Latin American history and art history to create artworks that represent a mishmash of eras as they transform each city's markers of identity into nationalities and mythologize the violence of war. In Smog and Thunder premiered as a gallery show in 2000, and was eventually followed by a 2001 mockumentary of the same name, directed by Sean Meredith and written by Birk and Paul Zaloom.